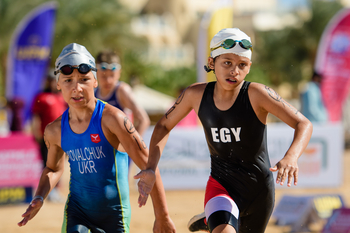 Ukraine and Lithuania demonstrated their Triathle prowess as they dominated the senior individual categories on day three of the UIPM 2018 World Biathle/Triathle Championships in Sahl Hasheesh, Egypt. Aurelija Tamasauskaite (LTU) denied Eliska Pribylova of the Czech Republic her third gold medal of the championships as she won senior women’s gold, with compatriot Lina Batuleviciute (LTU) claiming bronze. The senior men’s event saw six Ukraine athletes finish in the top seven, with Oleksandr Tovkai winning gold and Dmytro Baliuk taking bronze, with well-known pentathletes Dmytro Kirpulyanskyy and Yuriy Fedechko also finishing in the top six. The only non-Ukraine athlete in the mix was silver medallist Ondrej Svechota (CZE), who had teamed up with Pribylova (CZE) to win gold in both the Biathle and Triathle Mixed Relays earlier in the week. At junior level, South Africa enjoyed double gold. Dylan Kruger of South Africa beat Martin Vlach (CZE) to the men’s title with Roman Pleshkov of Kazakhstan completing the podium. Tara Schwulst (RSA) won the women’s title as Karolina Krenkova (CZE) took silver ahead of local athlete Noureen Elgamal (EGY). In the Under 19 category, the host nation enjoyed a memorable one-two as Mohamed Marzouk (EGY) and Ahmed Hefny (EGY) won gold and silver respectively. Visit the UIPM website for detailed results from day three. The UIPM 2018 World Biathle/Triathle Championships runs from October 25-28 with the individual Biathle categories bringing the competition to a close on October 28.